A Time "6 Queens You Should Know about for Women's History Month"
"A thorough, serious, and long overdue study of a fascinating ruler, Njinga of Angola is an essential addition to the study of the black Atlantic world." "Heywood tells the fascinating story of arguably the greatest queen in sub-Saharan African history, who surely deserves a place in the pantheon of revolutionary world leaders." "This fine biography attempts to reconcile her political acumen with the human sacrifices, infanticide, and slave trading by which she consolidated and projected power." 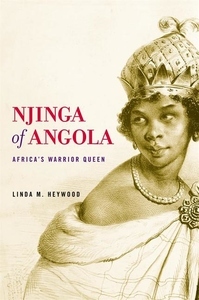 "Njinga of Angola sets out to replace sensationalism with facts...Heywood preserves all of the complexity of Njinga and her politics in a book that provides the most complete and foundational history."